Download the best JAMB CBT practice software that let you scale through the 2019 UTME like a genius. Our Computer-based testing (CBT) software is like that of JAMB with better user interface. Loaded with 24 SUBJECTS and you don’t even need internet to access them (it works offline). You are guaranteed of Getting Higher Score with this package. The JAMB CBT Software Does Not Expire, it will continue to function as long as your computer stays alive! How Much Does the CBT Software Activation Code/License Cost? We are giving out the software activation code/license for just NGN1500. You will agree with me that if you are to purchase JAMB past questions for four subjects, you will be spending nothing less than NGN3,000 to NGN3,500. In this case you are not limited to four subjects, you have 16 different subjects at your disposal. This implies that multiple persons can use the application even if they all offer different courses. 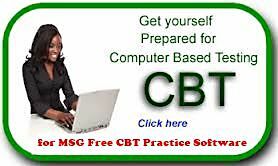 Download the JAMB CBT Software. If you are unable to download the software using the link above, you can also CLICK HERE FOR ALTERNATIVE DOWNLOAD LINK. As the application is a downloadable product, you can start practicing right away! Oh! How Can I Get The CBT Practice Software Activation Code/License? If you need the JAMB CBT Practice software license, you have to pay the NGN1,500activation code/license fee. CLICK HERE TO BUY THE ACTIVATION KEY NOW!